Hyaluronic acid (HA) lubricates your pet's joints. The hyaluronic acid in HyaFlex acts as a lubricant and shock absorber for joints and tissues, and will improve your pet's joint movement and mobility. 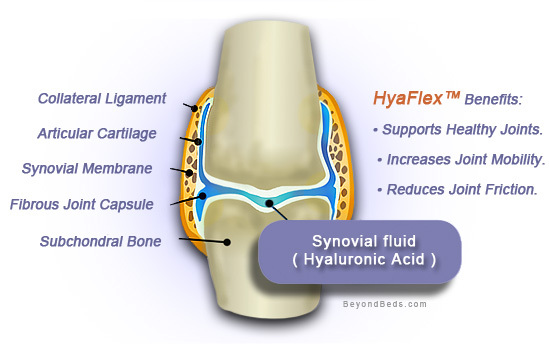 Hyaluronic acid is a naturally occurring compound found in the joints and connective tissue of all mammals. As your dog or cat ages their bodies produce less and less hyaluronic acid (HA) resulting in the breakdown of cartilage and other structure parts of the joint. This means pain for your pet, along with stiff joints and constrained movement. Hyaluronic acid in HyaFlex supplies what is needed for your pet's joint health. 30% of dogs and cats have some form of arthritis. There are a number of signs that have been identified as indicators of arthritis, and each sign is a sure call for Hyalogic HyaFlex. Does your dog show a resistance to walking, climbing stairs, jumping or even playing? Does your dog limp, lag behind on walks, show difficulty or discomfort when rising from a sitting position, yelp in pain when touched or show a withdrawal from touch? Are you seeing a personality change in your pet? It has been estimated that 30% of dogs and cats have arthritis, and one, or any combination of these signs warrants your attention. 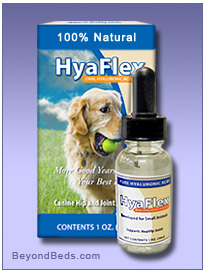 HyaFlex is the only patented oral hyaluronic acid for the treatment of your pet's joint conditions. It has been used to bring improved joint health and used in the treatment of degenerative conditions of elbows, hocks and shoulders in addition to the treatment of osteochondrosis (OCD), hip dysplasia , bursitis and arthritis commonly found in dogs. Hyaluronic acid in HyaFlex has a neutral pH which supports healthy functioning. Hyaluronic acid was first used in 1942. HyaFlex is not derived from an animal source. It comes from an extra cellular protein. HyaFlex is safe. Hypersensitivity reactions should not be a concern. The high molecular weight of the (HA) provides optimum lubrication in joint mobility. The hyaluronic acid in HyaFlex is one of the purest and highest in molecular weight, surpassing any other oral hyaluronic acid product available. Since higher molecular weight acid can hold more water it provides better lubrication and better shock absorption than low molecular weight hyaluronic acid. This means greater relief from stiffness, discomfort and pain for your pet. Directions for use: Add one (1) ml (full dropper) to your pet's food or favorite treat once daily or as recommended per body weight. (5 to 30 lbs. 1/2 dropper) (31 to 75 lbs. 3/4 dropper) (75 lbs + 1 full dropper). Note :Although hyaluronic acid has the term acid it is not acidic. Hyaluronic acid as a sodium salt (sodium hyaluronate) has a neutral pH. Hyalogic HyaFlex is made in the U.S.A. Note :This product ships the same day by USPS.